Abstract - The optimal location of controllers in wireless networks is an important problem in the process of designing cellular mobile networks. In this paper, we propose two new algorithms based on Particle Swarm Optimization (PSO) and Ant Colony Optimization (ACO) for solving it. Our objective functions are determined by the total distance based on finding maximum flow in a transport network using Ford-Fulkerson algorithm and pheromone matrix of ants satisfies capacity constraints to find good approximate solutions. The experimental results show that our proposed algorithms have achieved much better performance than previous heuristic algorithms. Abstract - Wireless Sensor Network is the network of power-limited sensing devices called sensors deployed in a region to sense various types of physical information from the environment when these sensors sense and transmit data to other sensors present in the network; considerable amount of energy is dissipated. In this paper, an effort has been done to propose F-MCHEL, a homogeneous energy protocol. In LEACH protocol the clusters are formed randomly on the basis of threshold values; whereas, in the proposed protocol a fuzzy logic approach is used to elect the cluster-head based on two descriptors - energy and proximity distance .Out of these elected cluster heads one Master cluster head has been elected .The cluster head which has the maximum residual energy is elected as Master cluster head. In conventional Leach approach all the Cluster heads are used to sends the aggregated information to the base station, however in the proposed protocol only Master cluster head sends the aggregated information to the base station. Simulation results on MATLAB shows that the proposed protocol provides higher energy efficiency, better stability period and lower instability period as compared to LEACH protocol in spite of overhead of election of Master cluster head. Results obtained shows that an appropriate Master clusterhead election can drastically reduce the energy consumption and enhance the lifetime of the network. Abstract - In this paper, a timed model called Resource Allocation Timed Automata (RATA) is considered, this model is constructed in compositional manner. Compared to the operational construction, this approach improves the scheduling in both time and memory space. We present two algorithms for finding the shortest paths applied to the RATA model in the case of job-shop problem. A set of benchmarks help us to experiment the efficiency of our approach. Abstract - Protein Function Prediction is important for its numerous applications in the field of drug discovery, gene ontology and its role in the complex structure formation. HPRD (Human Protein Reference Database) database contains the protein sequences for different protein classes. The sequences are accessed from HPRD and then different online tools are used to extract SDFs (Sequence Derived Features) for each protein sequence. In the present paper, two types of databases are considered: one containing the continuous values of SDFs and other containing the discrete values having range of SDFs for particular sequence. The paper summarizes the different decision tree methodologies applied for the problem of Human Protein Function Prediction. The accuracies for different approaches are presented for the specific databases. A new approach based on C5 decision tree is also presented and the results are compared with the existing approaches. 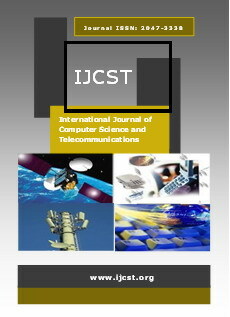 Abstract - Advances in communications and computation have ensured development of low-cost, low-power, small sized and multifunctional sensor nodes in wireless sensor networks. Because of its potential in all domains, WSN has turned out to be a popular research area. Quality of Service (QoS) is hard to maintain because of resource limitations and unreliability of transmission. Nodes close to the sink will be affected more in comparison to nodes multi hops away from the sink. This type of network traffic affects queue size and worsens packet loss. Packet scheduling algorithms and active queue management are usually taken recourse to for improving network QoS. In this paper, investigations on the quality of degradation are carried out. The quality degradation of the one hop node compared to nodes multihop away is studied. Investigations on the effect of load balancing at one hop node are carried out. Abstract - In any society, efficient and effective handling of information is a cornerstone for economic development. In this way, the Academia VPN Information Interaction on Internet and Mobile Media (AI3M2), a versatile system which exploits institutional data utilizing the Internet and mobile media for the Institutional communities in the country is envisaged. The (AI3M2) harmonizes the Virtual Private Network (VPN), Intranet, parser, Integrated Services Digital Network (ISDN) / Digital Subscriber Line (DSL) routers, SMS Server and mobile phone technologies to envisage the most intelligent, efficient, effective, and convenient way of sourcing and outsourcing useful and relevant data for the users. The institutional data reservoir stores heterogeneous information resources ranging from the traditional databases to semi-structured data. The parsers extract the relevant information from the reservoir and transmit them into the router. From the received data, the router performs various kinds of task determined by the application of data. The router converts network transmission data formats as well managing data transfer to the VPN. (AI3M2) applies a spoke and wheel mechanism to manipulate the heterogeneous instructional data reservoir (hub) under one process. The AI3M2 uses a Virtual Private Network (VPN) as a private network which is constructed within a public network infrastructure. Abstract - With the growth of World Wide Web the information containment is also increased. The search engines are used to retrieve the information from WWW so it is the responsibility of search engine to provide the relevant information to the web user against the query submitted to it. This paper describes the role of hyperlink structure as a graph and its characteristics used in searching. This paper explores different page ranking algorithm, factors affecting the page ranking and different problems in page ranking algorithms. Abstract - Today a large attention is given to the development of innovative wearable or ambulatory systems that able to monitor physio-pathological parameters of individuals in their daily activities. The goal to progressively move the health costs from cure to prevention leads to focus on the wellness and preventive cardio fitness. This report describes Wearable ECG recording system aiming to providing continuous monitoring of ECG signal which is amplified by the instrumentation amplifier (INA 321 from Texas Instruments).The acquired ECG signals are converted into the suitable format by the ultra low power microcontroller (MSP 430FG439) for storage in SD card. Abstract - A Brain Computer Interface (BCI) is a new communication channel allows a person to control special computer applications like a computer cursor or robotic limb through the use of his/her thoughts. BCIs had become an active research area in the last decade. BCI research is based on recording and analyzing electroencephalographic (EEG) data and recognizing EEG patterns associated with various mental states. Supervised classification methods are employed to recognize these EEG activity patterns to learn the mapping between the EEG data and classes corresponding to mental tasks. Selecting an optimal frequency band and extracting a good set of features is still an open research problem. In this paper, it is proposed to investigate EEG signals, extract features of motor imagery in the frequency domain using Hilbert transform, to compute the maximum and minimum energies. For efficient classification, Principal Component Analysis is used for feature reduction. Classification is carried out using multilayer perceptron with different learning rate and Momentum.